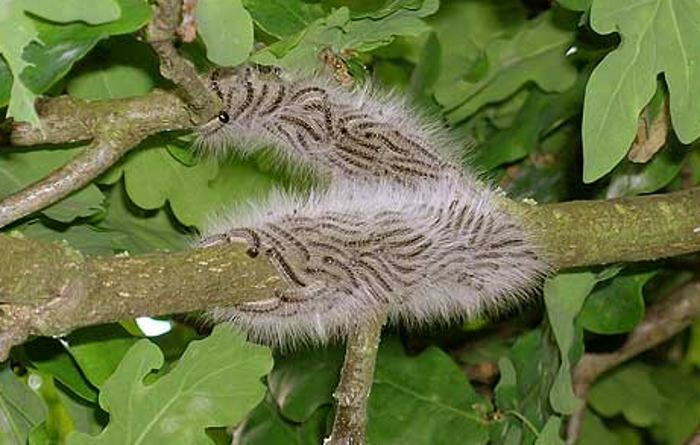 The Forestry Commission is asking the public in Camden and Westminster to report sightings of a particular caterpillar which is a threat to oak trees and can be a hazard to people and animals. Caterpillars from the oak processionary moth (Thaumetopoea processionea). Photo: Forestry Commission. The oak processionary moth (Thaumetopoea processionea, OPM) is a native of southern Europe, where local environmental factors and predators keep its populations in check. 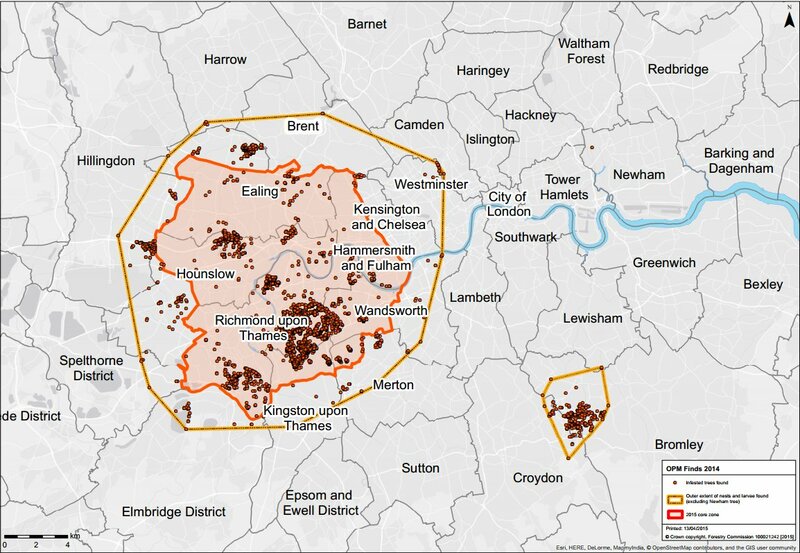 But it was accidentally introduced to Britain in 2005, and has become a problem in south west London. But this past winter its nests has been discovered in Regent’s Park and is a threat to oaks in Westminster and Camden. 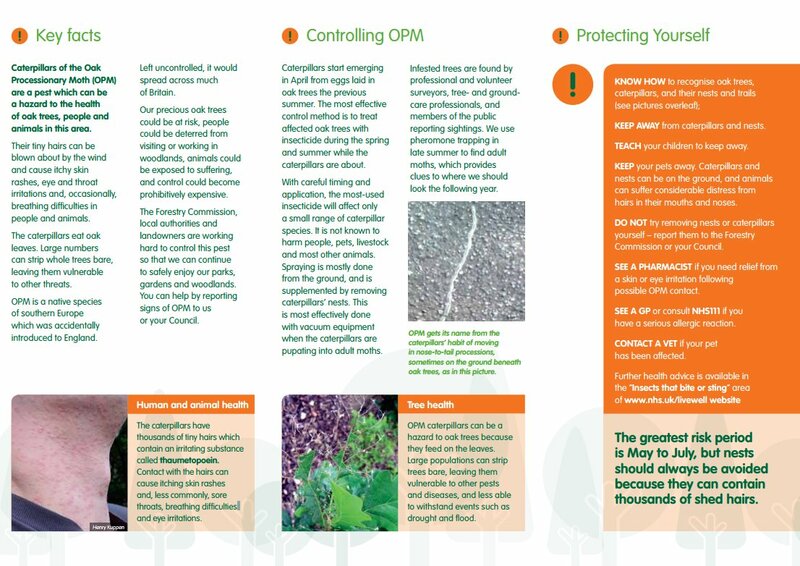 The Forestry Commission has now asked the Fitzrovia Neighbourhood Association and other community groups to distribute leaflets and raise awareness of the pest. 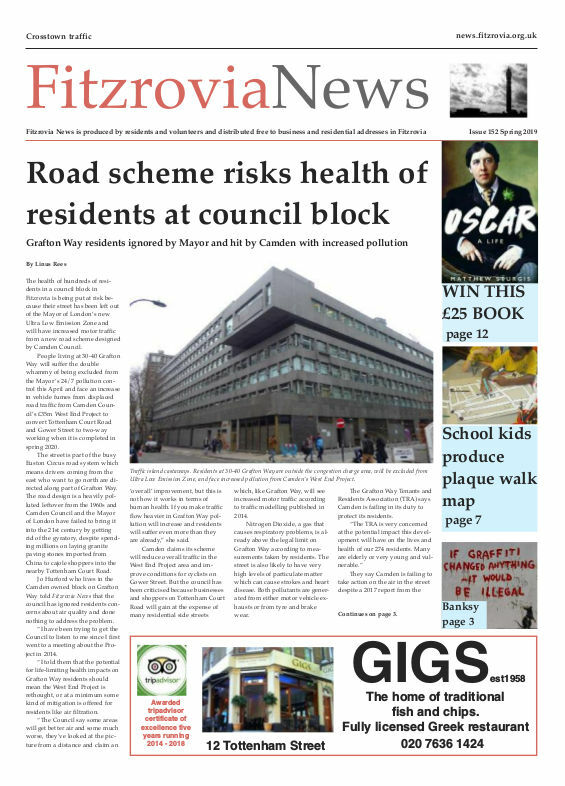 A spokesperson for the Forestry Commission told Fitzrovia News the OPM “is an imminent threat”. OPM caterpillars are most easily recognised by their distinctive habit of moving about in late spring and early summer in nose-to-tail processions, from which they derive their name, and the fact that they almost exclusively live in and feed on oak trees, says the Forestry Commission which is working with The Royal Parks and local councils to control the tree pest. The caterpillars also build distinctive white, silken webbing nests on the trunks and branches of oak trees, and leave white, silken trails on the trunks and branches in early summer. These nests and trails become discoloured after a short time, and more difficult to see as a result. The adult moth is an undistinctive, brown moth very similar in appearance to other, harmless species. They are active from mid to late summer, and lay their eggs on the smaller twigs and branches in oak trees. OPM key facts. Click to enlarge or see full leaflet. OPM caterpillars can threaten the health of several species of oak trees (Quercus species) because they feed on the leaves. Large populations can strip whole oak trees bare of leaves, leaving them vulnerable to attack by other pests and diseases, and less able to withstand adverse environmental events such as drought and flood. They will attack other trees if they run short of oak leaves to eat, and have been observed attacking hornbeam, hazel, beech, sweet chestnut and birch trees. The caterpillars have thousands of tiny hairs which contain an urticating, or irritating, substance called thaumetopoein, from which the species derives part of its scientific name. Contact with the hairs can cause itching skin rashes and, less commonly, sore throats, breathing difficulties and eye problems. This can happen if people or animals touch the caterpillars or their nests, or if the hairs are blown into contact by the wind. The caterpillars can also shed the hairs as a defence mechanism. Report OPM on 0845 367 3787 or see the Forestry Commission leaflet for more details of how to report sightings OPM-Leaflet-public-info-final_05-14. More information is available from The Forestry Commission webpage about OPM. On 27 May there is a talk on the OPM as part of London Tree Week 2015.